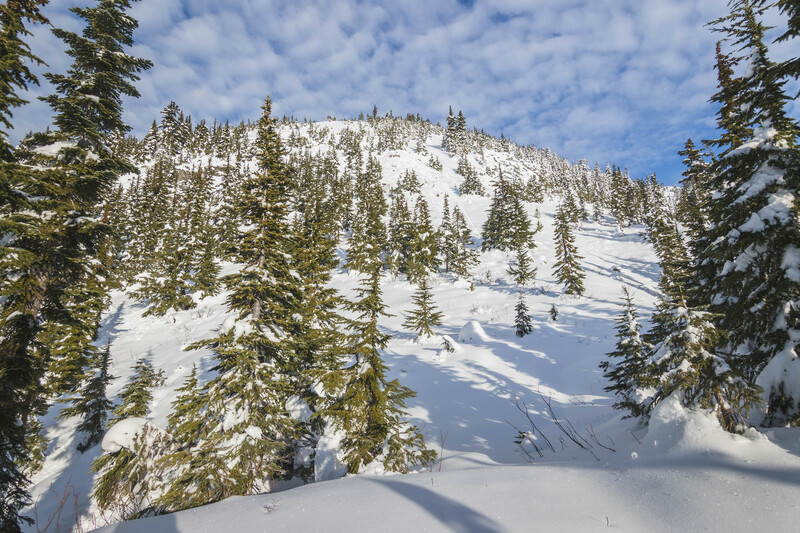 See other Snoqualmie Mountain trips here. Today pup and I finished off our Thanksgiving week hiking streak on one of my favorite mountains by Snoqualmie Pass. A long overdue returning trip; it had been four years to the weekend since my last visit with friends. 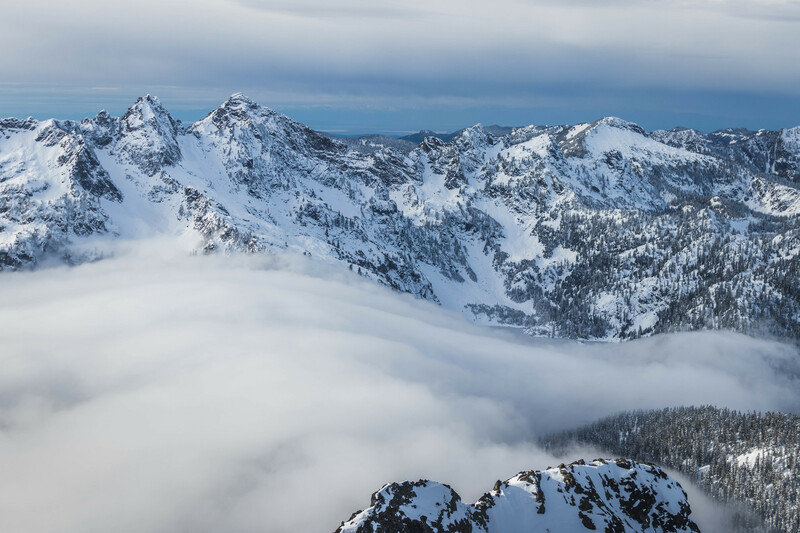 Snoqualmie Mountain towers over the South Fork Snoqualmie River drainage abounds with awe-inspiring views. One of the things I especially love about this mountain is its close proximity to Interstate 90. See more trip photos heree. 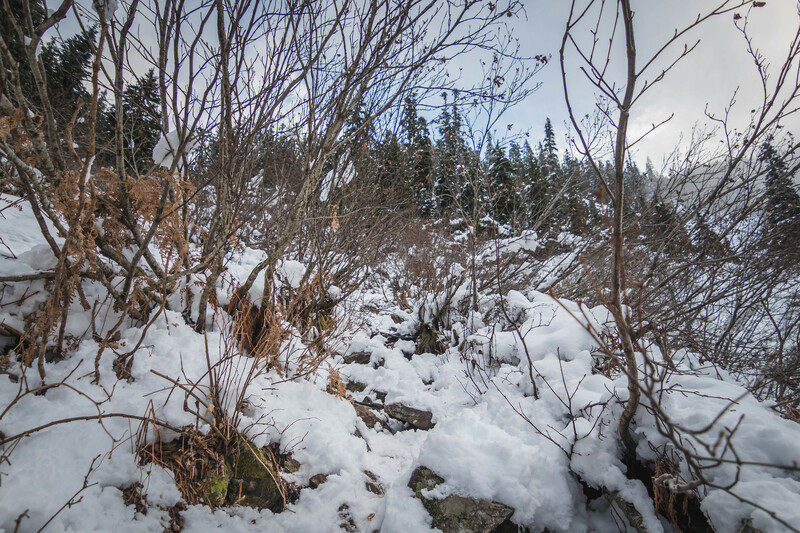 A nice trail had been broken since the latest snowfall from a few days ago. 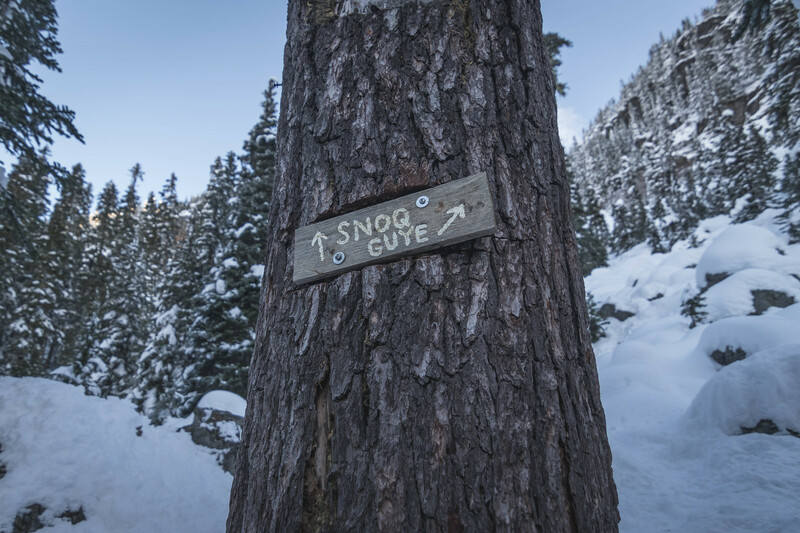 We followed the trail past the Snoqualmie Mountain-Guye Peak junction until it eventually dwindled by the headwall at 4400′ before the gully crossing. This looked to be everyone else’s turnaround point. 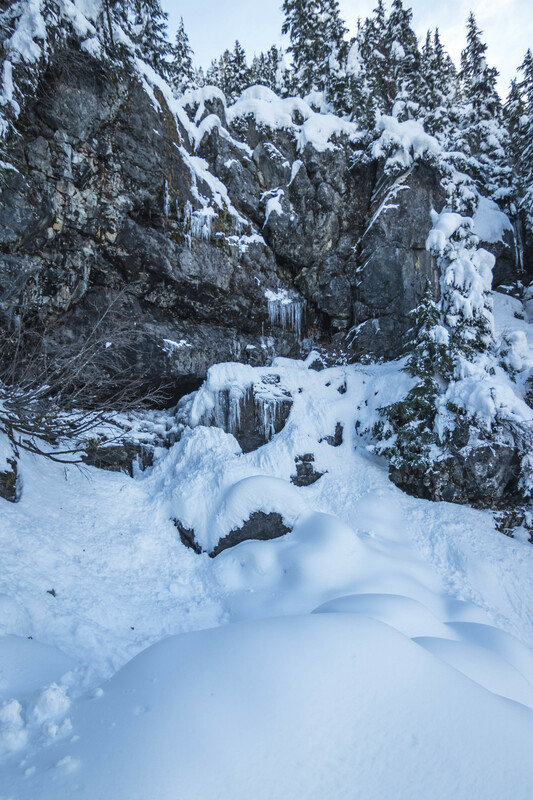 Upon crossing the gully, I switched from microspikes to snowshoes and continued on the steep slope adjacent to the gully, and finally broke out of the forest at 4800′. 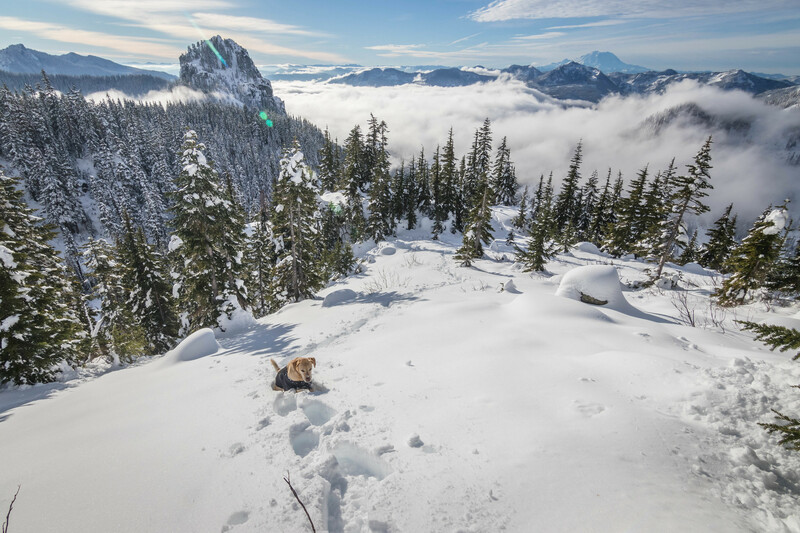 For the next 1500′, pup and I slowly and laboriously plowed through fresh snow on the south ridge. The wind began to blow just as terrain steepened. Several times we dodged the wind gusts by moving to the leeward side of the crest and traveled in deeper snow. The wind became more tolerable in the final 300′ to stay on the crest in shallower snow. Once on the summit ridge, we traversed northwestbound a short distance to reach the summit. 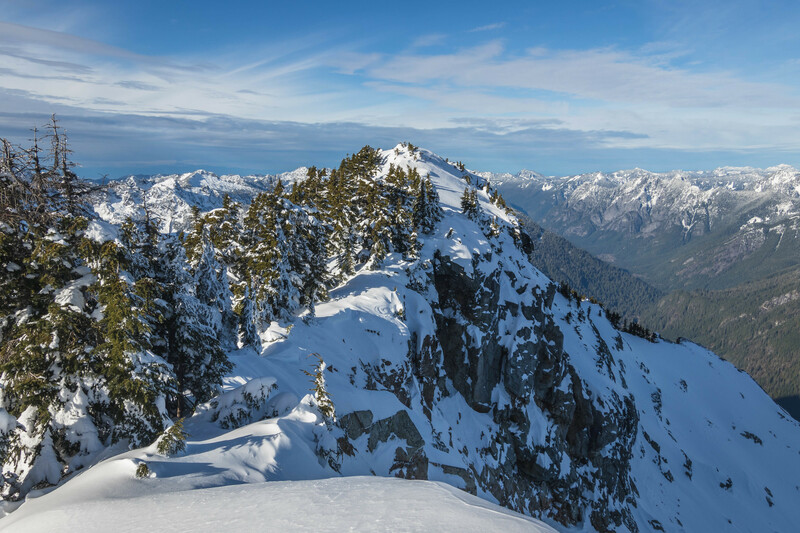 This summit remained to be one of the best vantage points in viewing other parts of the Alpine Lakes Wilderness, including high points along the Pacific Crest Trail just east of here. 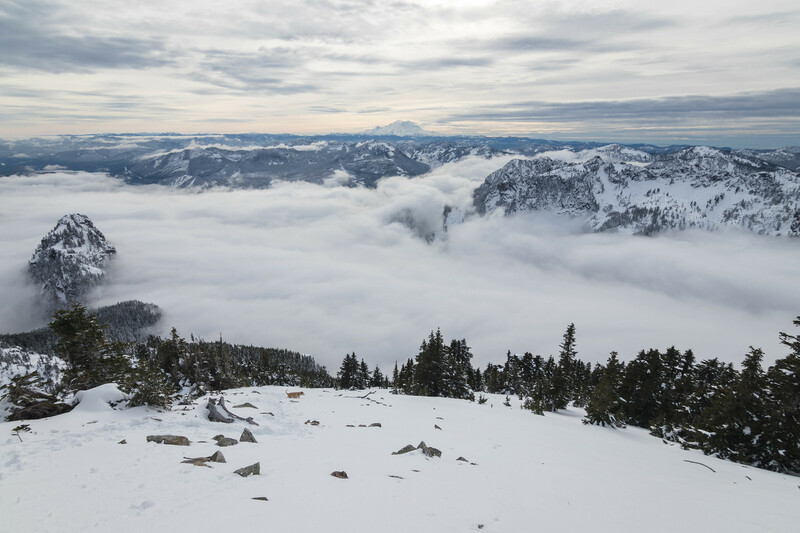 Chair Peak, Snow Lake Basin, Mount Thomson, Alta Mountain, Mount Rainier, Stone Kingdom, oh my! Kimber and Carl, a couple from Tacoma, WA, showed up about an hour after pup and I summited. Glad they could benefit from our tracks before the next snowfall scheduled to arrive in a few days. Weather was so good, albeit windy, that we spent a long time on top before plunging our way down the mountain. 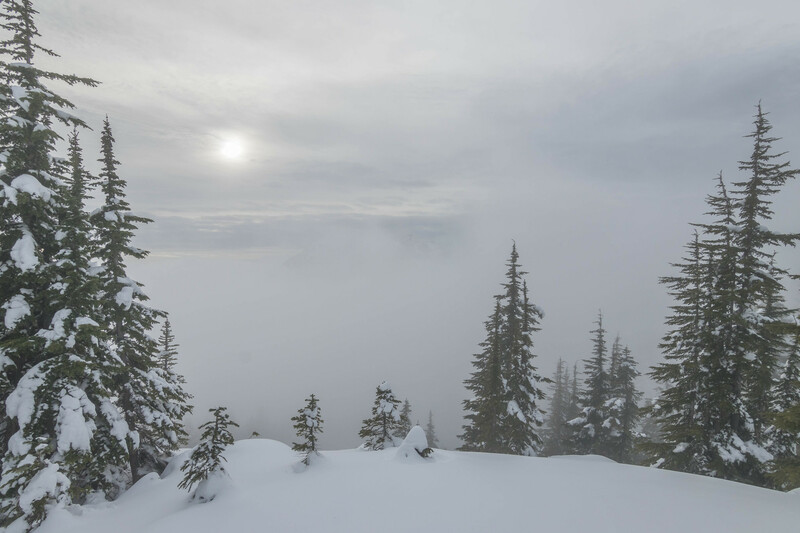 Temperature inversion sweeping over Snoqualmie Pass and the Snow Lake Basin became even more dramatic as the day went on. Ridgeline above Source Lake Basin was starting to be devoured by the rising clouds just as we ourselves slowly descended into the misty forest.